Using Subway Line 1 we arrived at Nampo Station and followed the signage to Jagalchi market. It has been said that this is the biggest fish market in South Korea but upon entering I felt a bit underwhelmed. Maybe because we were only a handful of visitors at the time and the place looked empty. After a quick walk around we randomly picked a stall and bought our lunch; a flounder, a few abalones, an octopus, and a king crab. Don’t forget to negotiate on the prices, for example, the seller was asking 65,000KRW per kg for the king crab, I managed to get it down to 55,000KRW per kg but having researched previously I know it can go even lower if I persisted. You can bring your fresh seafood to the 2nd floor where there are many restaurants that will cook and prepare them for you for a fee. They will charge you a sit on fee as well as each individual preparation fee. Do inquire beforehand so that you aren’t surprised by the final bill. After lunch we made our way to BIFF Square which is less than 10minutes walk away. Just outside of Jagalchi Market building you will see Ajummas selling more seafood by the roadside. Busan International Film Festival (BIFF) Square is a collection of 400+ meters long street comprising of theaters, street vendors and trendy shops. It’s an excellent place for a long walk and window shopping after a good hearty meal. Don’t forget to try Ssiat Hotteok, Busan’s version of the popular Korean Hotteok, a sweet pancake filled with brown sugar and a varities of seeds. Next day we took the subway from Busan station to Haeundae station, the journey took about 50mins with 1 transfer and passes 22 stations! From Haeundae station we took a taxi to Haedong Yonggungsa. You can also opt to take the bus from Haeundae station but will require an additional 10mins walk to the temple, the bus will drop you opposite of Lotte Premium Outlet (shopping after temple visit anyone?). Having seniors and children with us we decided on taxi! The taxi fare cost about $10,000KRW. There are taxis at Yonggungsa Temple entrance so we took one and head for the beach. During summer this place would be filled with Korean beach goers. It was slightly chilly when we were there but that doesn’t stop us from dipping our legs into the icy water! https://www.facebook.com/plugins/video.php?href=https%3A%2F%2Fwww.facebook.com%2Fmartinjrlim%2Fvideos%2F10154567308126365%2F&show_text=0&width=560Feeling hungry we went to look for food and we chance upon a line of bright yellow tents just next to the beach. Warning – These tents are bloody expensive! 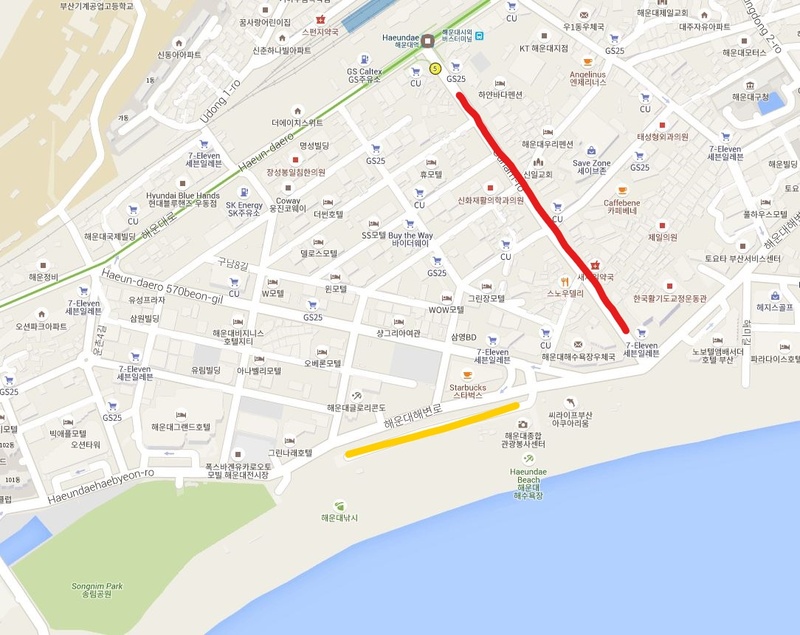 15minutes walk away is a street filled with restaurants, and at the end of the street is Haeundae station. * Yellow line is where the yellow tents are and the red line is where you will find plenty of eateries. For those who have more time in Busan and feeling energetic, do have a look at this blog, Bound for Busan, for a great list of to-do’s. Places I had to forgo were Taejong-Dae, Gijang Market (for crabs! ), Lotte Premium Outlet (near Haeddong Yonggungsa), and Gujke Market (near BIFF Square) due to fatigue!